Carpet King was launched as a subsidiary of Gillies of Broughty Ferry in 1988. At that time our primary objective was to clear the backlog of roll ends created by the Gillies store. However, it soon became clear that there was a growing demand for quality carpets at budget prices and so we started to buy in bargain end of range carpets and excess stock rolls from many of our key suppliers. And now over 20 years on Carpet King has established a niche market in the local area, offering no nonsense, great value on limited stock carpets and flooring. Today, Carpet King offers a selection of over 300 roll ends at any one time in all sorts of sizes, colours and types of carpets as well as over 60 rolls of stock carpet and 20 rolls of stock vinyls for kitchens and bathrooms, in popular designs, colours and sizes. Many of our customers take their purchases home straight away. However, Carpet King does offer a delivery service as well as a full professional fitting service for any type of flooring. Our staff are trained to provide the best possible advice and can arrange a free of charge measure to be carried out in your home. This gives you peace of mind knowing that measurements are accurate. Carpet King (Dundee) is a stand-alone store and has no connection to any other store or business trading as Carpet King. 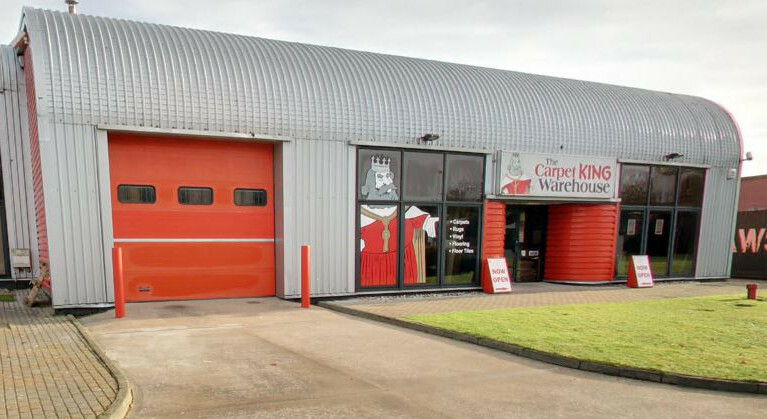 Take an online tour of the Carpet King warehouse using Google streetview.